The critical water emergency continues and citizens should not utilize any City water until further notice. 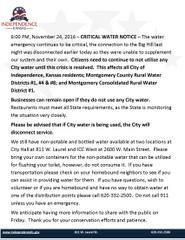 6:00 PM, November 24, 2016 – CRITICAL WATER NOTICE – The water emergency continues to be critical, the connection to the Big Hill last night was disconnected earlier today as they were unable to supplement our system and their own. Citizens need to continue to not utilize any City water until this crisis is resolved. This affects all City of Independence, Kansas residents; Montgomery County Rural Water Districts #1, #4 & #8; and Montgomery Consolidated Rural Water District #1. Businesses can remain open if they do not use any City water. Restaurants must meet all State requirements, as the State is monitoring the situation very closely. Please be advised that if City water is being used, the City will disconnect service. We still have non-potable and bottled water available at two locations at City Hall at 811 W. Laurel and ICC West at 2600 W. Main Street. Please bring your own containers for the non-potable water that can be utilized for flushing your toilet, however, do not consume it. If you have transportation please check on your homebound neighbors to see if you can assist in providing water for them. If you have questions, wish to volunteer or if you are homebound and have no way to obtain water at one of the distribution points please call 620-332-2500. Do not call 911 unless you have an emergency. We anticipate having more information to share with the public on Friday. Thank you for your conservation efforts and patience.